The art world today is a highly exclusive institution, but it hasn’t always been that way. In Guest of Cindy Sherman, the new documentary by Paul H-O and Tom Donahue, we get a peek behind the curtain of the establishment, where it came from, and a glimpse of what’s it like to be the man next to one of the most important women in modern art. The film is fascinating despite its lack of a specific focus as it seems to be about the 1990’s New York art scene, then an almost accidental romance between Cindy Sherman and co-director Paul H-O, then what it’s like to be in the shadow of a celebrity artist. Regardless of where the camera is aimed though, the results are always interesting. The core figure in the film is Paul H-O, a lighthearted artist with a cable access show called Gallery Beat. As the show progresses, we quickly watch his art career and marriage disappear as his access to the art world grows. 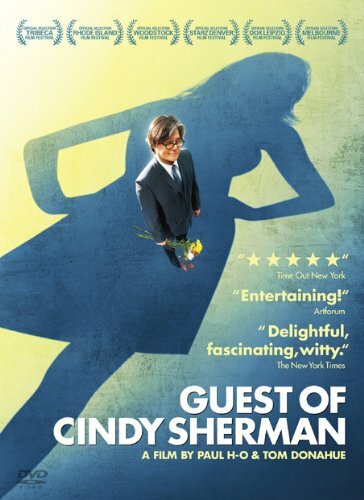 After a brief encounter with Cindy Sherman, who is famous for her limited press exposure, Paul eventually talks his way into Cindy’s studio and then later, her heart, as they begin a relationship, which lasts for just over five years. While the film attempts to focus on the difficulty of being the “guest” of a famous artist, the most revealing and memorable aspects of the film are the very personal glimpses of Sherman herself working in the studio, discussing her work, and enjoying the trappings of her success.